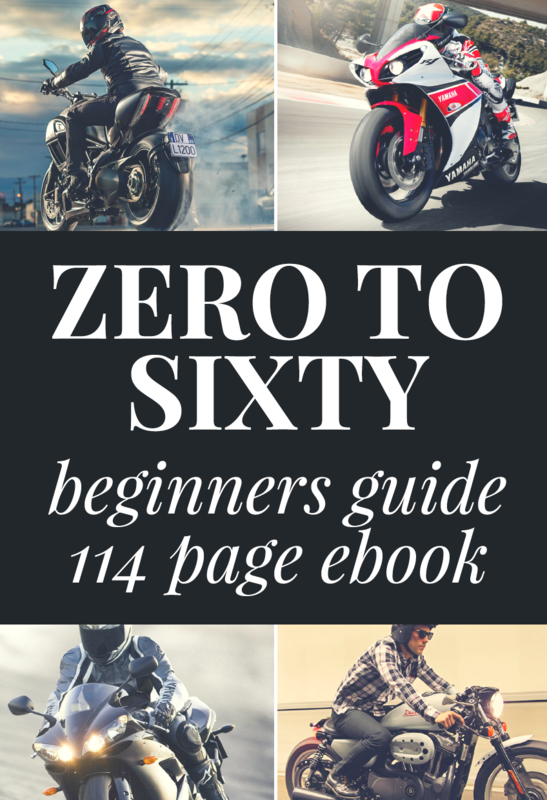 When it comes to long distance riding, the main two elements desired in a motorcycle are rider comfort and the ability to maintain highway speeds comfortably. You won’t last more than a few hours (at most) if you lose all feeling in your lower extremities due to the physical discomfort caused by an overly aggressive riding position or poor seat ergonomics. Aftermarket and custom touring seats can often minimize or improve the ergonomic factor, but there aren’t many options beyond higher handlebar risers to help with a bad riding triangle. Check out this motorcycle ergonomics simulator to match your body type to bikes you’re considering buying to get an idea of how you would fit it. Similarly, if your bike struggles to reach 70 mph, anything above that will be at an extremely high RPM. High RPM usually creates irritating amounts of vibration and can add to rider discomfort. To avoid this, it’s preferable to have a 6 speed transmission and a somewhat larger engine than the typical motorcycles beginners opt for. Engines in the 500cc to 800cc range strike a good compromise between being less than ideal for touring and too powerful for a beginner to manage. Next would be the capacity to carry luggage and/or a passenger while still having adequate power. Panniers, saddlebags, and tank bags are an option on most bikes, but not all have a great selection. So here they are: my five favourite used touring bikes for beginners on a budget of $5000 or less. I’m sure no one is surprised to see the SV650 as the easy pick for beginner sport touring bike. It’s been a favourite for new riders since 1999, when it was introduced to the market. Suzuki has wisely embraced and even championed the newbie-friendly nature of the SV over the years. The SV is equipped with a half fairing or as a naked bike, depending on the model year and location you’re shopping in. In the picture above you’ll see the S model, which has lower handlebars than the typical SV does. For touring you’ll likely want to avoid the S model for that reason. 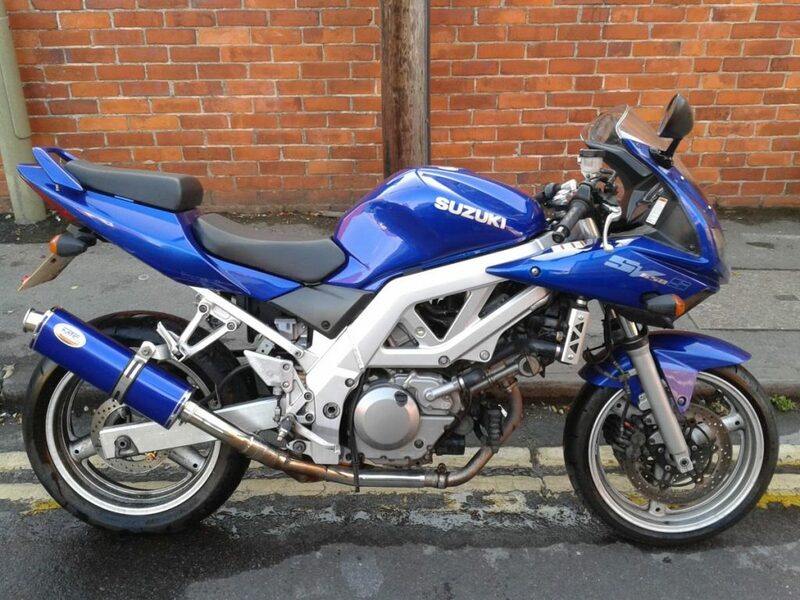 If you come across a Suzuki Gladius SFV650 that’s just an SV650 by another name. Suzuki was having an identity crisis with this bike back in 2009 it seems. The SV has ample power for the highway and a 6 speed transmission to go with the excellent handling you’d expect in a sport touring bike. They are lightweight bikes at 436 lbs wet and easily controlled while at low speed or sitting still, but the bike definitely has a good power to weight ratio and as such needs to be respected by a novice rider. The frame and seat are narrow thanks to the V-twin power plant it uses, making it easy to straddle and touch flat foot for almost anyone. The SV has a sporty riding position, but because the seat is set lower in the frame and the bars higher, it allows for fairly long rides without major discomfort. Specifically, if you go after ones 2004 and newer, the seat height is about one inch lower than previous years. This isn’t a deal breaker though, since the higher seat is only 31 inches which most people can still touch the ground flat footed on. The seat isn’t bad as typical sport bike standards with regards to comfort, but if you plan on going for long trips, it’s preferable to swap it out for an offering from Corbin or Sargent (for example). It doesn’t come equipped from factory with any luggage options unfortunately so you’ll have to go aftermarket. Not a problem, as there are plenty of options to choose from. Word on the street is that MotoPak makes a great set of soft luggage for the SV650 that comes on or goes off in 30 seconds and isn’t too hard on the wallet. Something especially nice on the 2017 SV650 is the introduction of a low RPM assist feature. With this technology, the bike will automatically raise engine RPM on a sloppy start instead of letting the bike stall! That may be the best beginner feature I’ve ever heard of, since learning to control your clutch and throttle from a standstill is challenging for most beginners. Too bad the 2017 model isn’t quite selling for $5000 yet. They’re about $7000 new, so give it a year or two then they will be. From what I can tell, you can buy some SVs as new as 2014 within our budget, but more commonly in the 1999 to 2009 range. 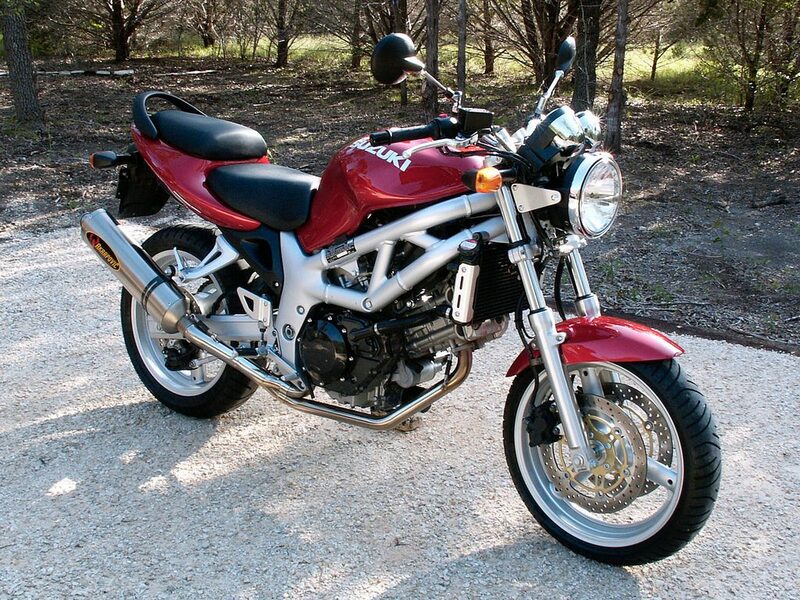 See our more in-depth Suzuki SV650 review. 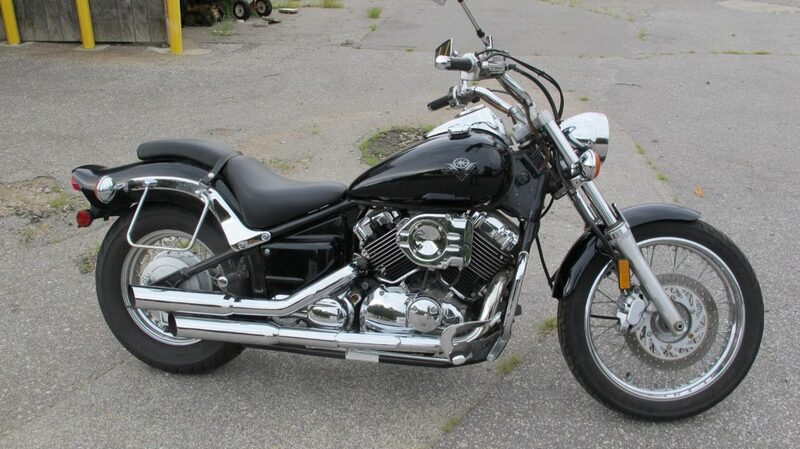 If more laid back riding is your preference, take a long look at the Yamaha V-Star 650. The V-Star comes in a Custom trim that has smaller fenders and narrower wheels compared to the Classic version. 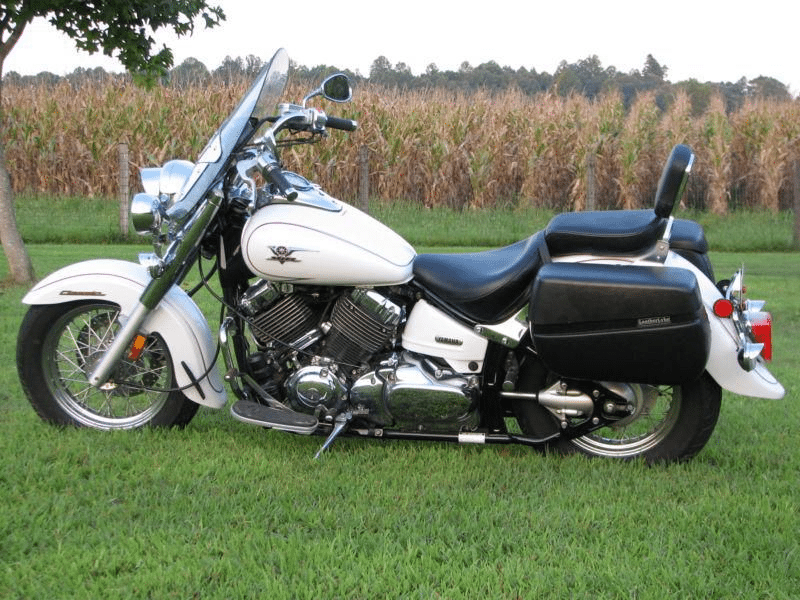 This is a lightweight, maneuverable cruiser with a friendly amount of horsepower and torque for a new rider to manage. Don’t worry, as there’s still enough power to keep you interested over the long term and to handle highway speeds. The 5 speed transmission is adequate, but a sixth gear sure would have been nice. The shaft drive system used on the bike is super reliable and easy to maintain. Just change the oil according to the manufacturer’s schedule… that’s it! It’s definitely the way to go if you’re riding across the country through all kinds of weather. The V-Star is equipped with a comfortable seat and a laid back seating position suitable for long rides. Being that the seat height is just over 27 inches, I think most anyone can sit flat footed on it comfortably. Aftermarket windshield options are plentiful and a great idea for long rides. You’ll want to invest in aftermarket luggage as none comes standard with the bike. Lots of hard or soft saddlebag options are available for it luckily. 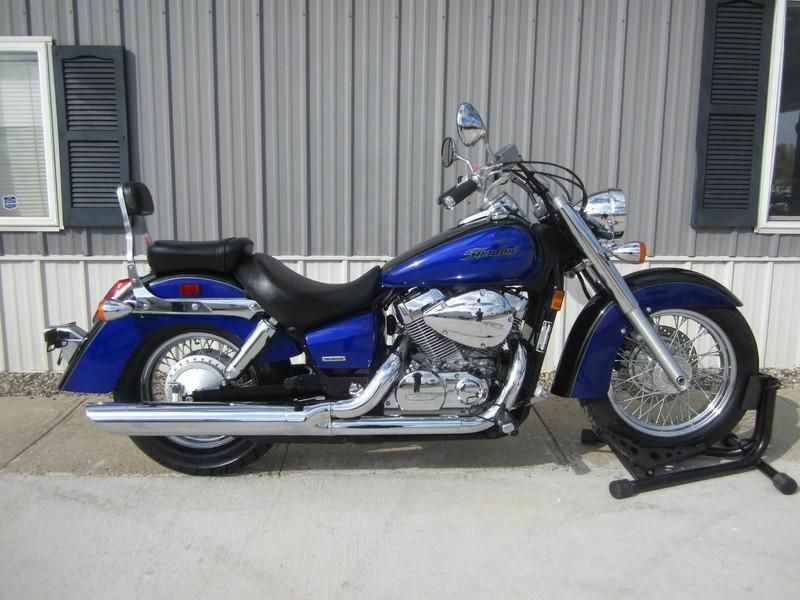 The V-Star is a bargain on the used market and can easily be had for under $5000. If you spend up near the limit, you can often net models as new as 2014 with low miles. 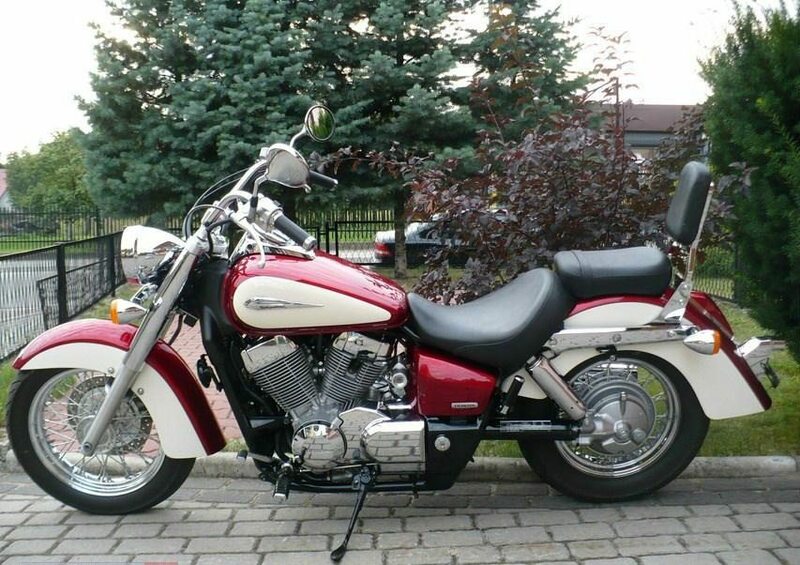 Similar to the V-Star 650 is the Honda Shadow Aero 750. The main difference is the extra 100ccs of displacement and the liquid cooled engine on the Honda . The Aero first dropped in 2004 as a carbureted bike until 2010, when PGM – Fuel Injection became standard. Those are the Aeros to buy, as FI is low maintenance, more fuel efficient, and less trouble overall. Not that there’s anything wrong with the carbureted ones before that if your budget is such that the newer Shadows don’t fit. Any year of Aero is a great option, even just on the longevity and reliability of the Shadow line of Honda bikes. It’s very common to find them running perfectly well after turning over 65,000 miles, so don’t shy away from high miler Aeros. The engine in this bike has a very “Harley Davidson-esque” quality to it, especially the sound coming out of aftermarket tailpipes. Plenty of low end torque graces the Aero, and combined with a wide ratio 5 speed transmission, the bike pleasant to ride long distances at highway speed. I wish it had a 6 speed transmission, but that wasn’t the way Honda went. The Aero is equipped with a shaft drive system to send the power to the rear wheel. This is ideal for touring long distances, as maintenance consists of a quick oil change once every 24,000 miles or so. I would rather change it at each engine oil interval myself. The housing only holds a small amount of oil, so it doesn’t cost much money or time. That is priceless compared to messing around with chain lubrication and adjustment needs. The seat is very wide and accommodating for your posterior’s requirements while touring. The bike has a comfortable laid back riding position with easy to reach handlebars. You’ll probably want to mount an aftermarket windshield and highway pegs forward of the mid mount factory location for greater comfort when touring. They don’t come standard, but there are plenty of aftermarket options available for the Aero due to the massive following of the Shadow line of bikes. It’s quite likely to come already equipped second hand with all the touring goodies on it. You’ll have no issues finding an Aero to fit in under the $5000 cap, with money leftover to buy a windshield and saddlebags if need be. The “wee-strom”, as it’s often called, is a near perfect beginner touring bike when it comes to reliability, comfort, and versatility (thanks to it’s dual purpose nature). It’s not meant to really go full-throttle, bush bashing with true off road bikes, but it’ll hold it’s own on gravel and dirt paths until things get too crazy. The ones with spoked wheels are more suited to off road riding. 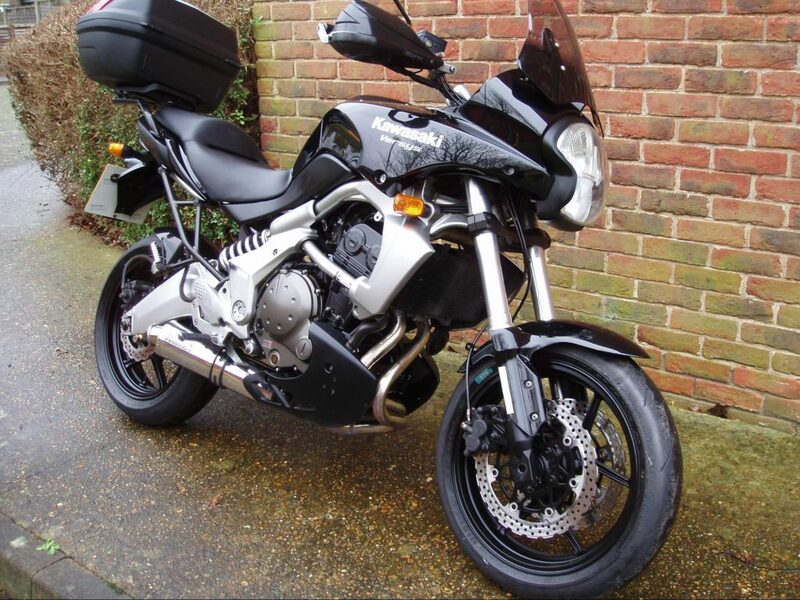 Of all my picks I’m recommending here for a beginner touring bike, the V-Strom is my number one choice. Interestingly, it has a huge and devoted following with most owners not belonging to the beginner ranks, meaning you could hang on to this bike for a long time and be totally happy with it. It just does everything well and has nice amount of technology on it, all for a reasonable price. In short, it’s simply the best value out of the bunch and that really is the whole focus of this article. The same engine from the SV650 lives in the V-Strom, but it’s tuned differently for more power down low in the 4000 to 7000 rpm range. The result is a much more linear and predictable type of power that is sweet both on the asphalt and off it. It comes with a 6 speed transmission to engage the its “horses”. All these bikes from 2004 to present are fuel injected, and ABS became an option in 2007. I think the only somewhat negative aspect of this bike is the chain final drive, but for off road riding it does make sense. On long journeys you’ll want to bring along chain lube, or invest in an automatic lubrication system from Cameleon or ScottOiler for more carefree riding and peace of mind. The ‘Strom weighs under 500 lbs wet, but since adventure bikes are a bit taller than most bikes, it may feel a little top heavy for shorter riders. Make sure to try before you buy to gauge fit. The standard type riding position on the ‘Strom makes it the easiest one to live with on your long bike trips while also helping with controlling the bike through turns and over rough terrain. The seat is actually surprisingly good right from factory, as are the ergonomics in general. Suzuki really did their planning well in designing the V-Strom. No problem at all since adventure bikes are expected to have huge panniers strapped on the back. Suzuki sells them, as do other big name manufacturers like SW Motech and Givi. All you have to do is pick one of them that fits your needs. 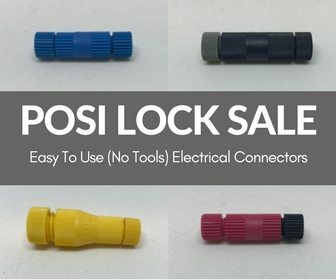 Try and convince the seller to include a set in the final price if possible (if they aren’t already). What a bargain for these very hardy bikes on the used market! Our $5000 can likely get you one complete with a luggage set and other aftermarket goodies already installed. I’ve seen even 2010 model years with low miles listed for under $5K. You won’t quite get to the 2012 (second generation )bikes’ asking price unless you are really lucky. No big deal as it was just some styling changes and a few more horsepower added to the second gen ‘Stroms. The Versys 650 has been a thorn in the V-Strom’s side since 2007 when it was introduced to the world. More than a few times motorcycle reviewers have given the edge to the Kawasaki over the Suzuki, mostly because it is lighter and better handling than the ‘Strom is in the “twisties”. 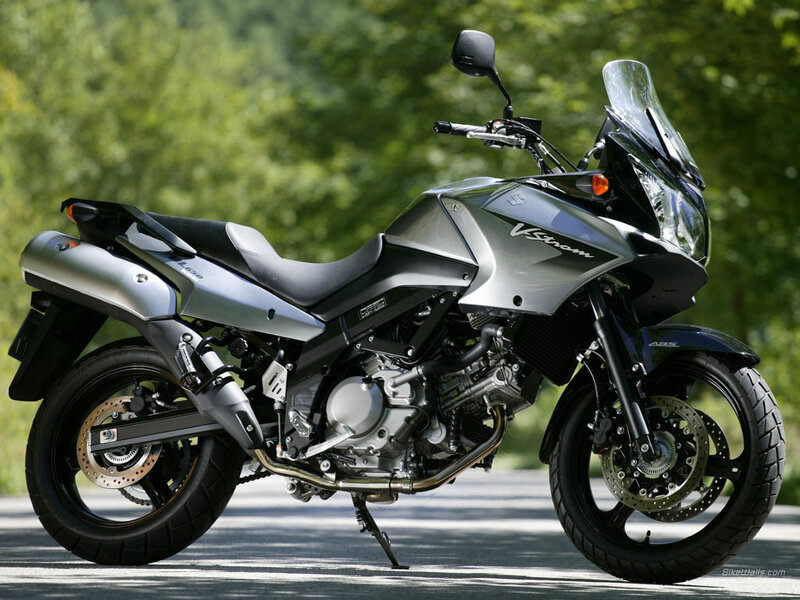 It’s still considered an adventure bike, but it’s more of a sporty, on-road kind than it is a true dual purpose bike. The inverted forks, 17 inch front/rear wheels, and the fact that it shares the same parallel twin engine with the Ninja 650 probably have a lot to do with that fact. Kawasaki “de-tuned” the Ninja engine for more low range power between 3000 and 6000 rpm. 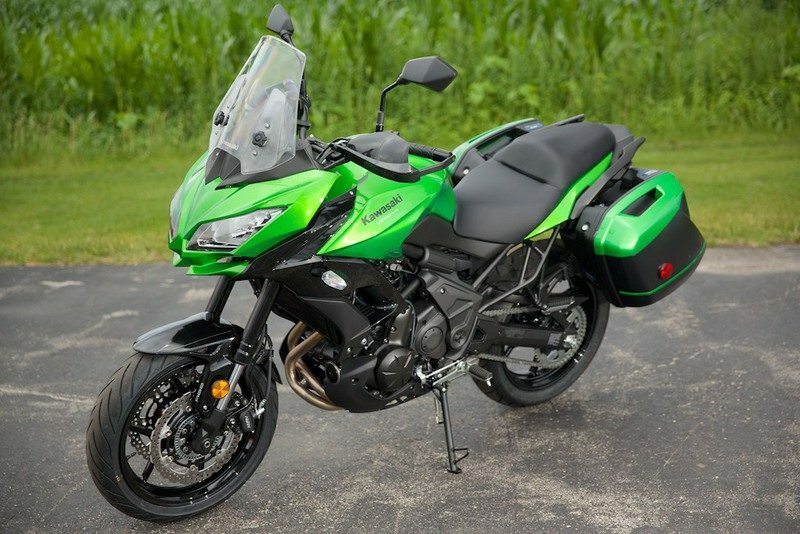 It seems the Versys is not so much an adventure bike and more a tallish sport touring bike. On the other hand, that Ninja pedigree hasn’t been completely muzzled because I’ve heard some riders complain about it having a “twitchy” throttle at times. Sport bikes throttles can definitely feel a little jerky at low rpm, and that’s what I think the twitchy throttle comments stem from. In truth, even though the Versys has slightly less horsepower and torque than the ‘Strom, it feels more nimble and exciting to many riders. It’s really a toss up between the two that comes down to personal preference. Sporty or Comfy? I still would recommend the V-Strom first for the reason that predictable and smooth power is more learner friendly. For a sport-biased adventure bike, the Versys is comfortable to a degree that surprises most people who judge it solely on appearance. It puts the rider in a standard upright position, has wind protecting handguards, and a decent seat on it. 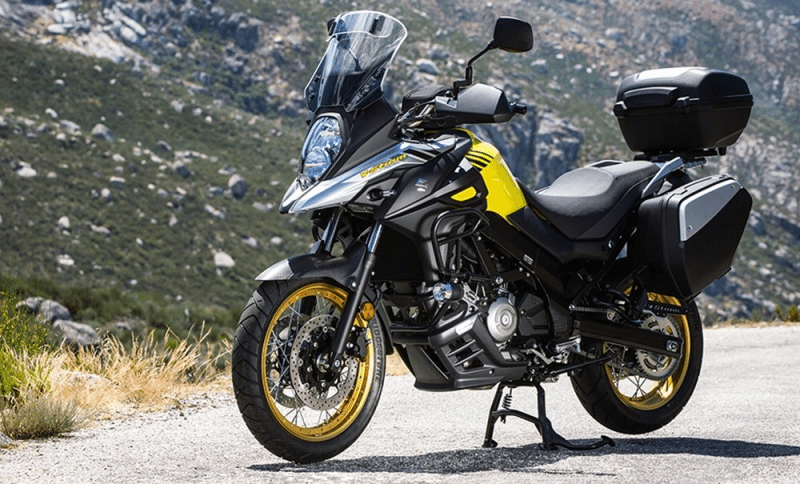 The V-Strom seat probably is slightly better for touring, as it has a wider flat area, but most everyone swaps the seats out on either bike for extensive touring anyway. The Versys didn’t come standard with sleek, factory panniers on it until 2015, and only then on the LT model (Light Touring). No problem though, as there are plenty of aftermarket options out there from a multitude of makers, like Tusk and Givi, that make very affordable and durable luggage. This bike is about $8500 new in 2018, which is very affordable compared to most any other similarly sized adventure bike (including the V-Strom). Used Versys can easily be bought for around $3000 in great shape with lots of options on them. For our budget, you could even buy as new as 2015 if you happen upon a screaming deal, but more likely you’ll find one around the 2014 model year.